4 [Fri] 7pm: Odyssey Chamber Music Series: Life & Love: Liebeslieder. $20 General Admission, $10 Student, Free Children Under 12. First Baptist Church, 1112 E. Broadway in Columbia. 15-18 [Tue-Fri]: Piano Guild: Auditions in Jefferson City. 24 [Thu] 11am: MMAMTA Spring Annual Luncheon Meeting, Madison's Cafe at 216 Madison St in Jefferson City. (573) 634-2988. 29- June 1 [Tue-Sat] Piano Guild: Auditions in Columbia, to be held at the private studio of Judy Knudson. 6 [Fri] 7pm: Cameron Carpenter, International Touring Organ presented by the University Concert Series. [See his video, Bernstein's "Candide" overture, here!] "Cameron Carpenter is smashing the stereotypes of organists and organ music worldwide, and all the while generating international acclaim and controversy unprecedented in his field. After launching his International Touring Organ (ITO) in 2014 which has since escalated to live performances for audiences on four continents, Cameron Carpenter embarks on his next US national tour, playing this monumental cross-genre digital organ built by Marshall & Ogletree to his own design, responding to the demands of multiple genres from Bach to film scores, as well as Cameron’s original compositions, transcriptions and arrangements." $48/$38 Tickets at the University Concert Series web site or the Missouri Theatre box office. 7-9 [Sat-Mon]: Mizzou Centennial Celebrations. See full schedule [CLICK HERE]. 9 [Mon] 7pm MU School of Music Centennial Celebration: The Chancellor's Showcase at the Missouri Theatre. Celebrating 100 years of Music at Mizzou: The 2018 Chancellor’s Arts Showcase will serve as the culminating event of the School of Music’s Centennial celebration. Music from significant alumni, composers, faculty, and events of the last 100 years will be performed. Several alumni and special guests including retired faculty and administrators will join us for this special celebration. Admission $18. 19 [Thu] 7pm: University Concert Series presents Choral Union with Dr. R. Paul Crabb and the University of Missouri Choral Union, in Poulenc: Gloria, Bernstein: Chichester Psalms, and Beethoven: “Gloria” from Missa Solemnis. Feel the power of over 200 performers on stage as the CCO joins the MU Choral Union to perform two spectacular Glorias and Bernstein’s stunning Chichester Psalms. Admission $23. 24 [Tue] 7pm: The Jefferson City Symphony Orchestra: The Piano Concerto Competition Winner Performance. The winner of the 2018 Jefferson City Symphony Orchestra will perform their winning concerto with the JCSO on its final concert of the 2017-2018 Jefferson City Community Concert Association series. The competition will be held on February 10, 2018. Each Missouri college, university or private teacher is permitted to submit candidates for the competition. Also eligible are residents of Missouri who are studying out of state. Tickets are available online or at the door. $15 (adults), $5 (students). Mitchell Auditorium, Lincoln University Campus in Jefferson City. ​26-27 [Thu-Fri] Missouri State Festival by MSHSAA (Missouri State High School Activities Association) at the University of Missouri. 2 [Fri] 7pm: Odyssey Chamber Music Series: Scenémagic (MOdyssey) featuring everything from a clarinet duo to "La-La-Land" vocalist Angela Parrish from Hollywood and her musical partner, jazz trumpeter Andrew Linn from New York City. Special $10 General Admission, $5 Student, Free Children Under 12. First Baptist Church, 1112 E. Broadway in Columbia. 11 [Sun]: 7:30pm: Missouri Composers Project (MOCOP) at Broadway Christian Church in Columbia with Emily Edgington Andrews and the Columbia Chamber Choir, High School and Open MOCOP Choral Winners, High School and Open MOCOP Orchestral Winners. The Columbia Chamber Choir joins the CCO to perform new works by Missouri composers, which are selected by a competitive process, during the seventh annual Missouri Composers Project. Free Admission. 16 & 17 [Fri/Sat] 7pm: Odyssey Chamber Music Series & Missouri Contemporary Ballet: Prokofiev's Cinderella for two pianos. Admission $48/$38/$28. Missouri Theatre, 203 S Ninth St, Columbia. ​22 [Thu] 7pm: The Southside Philharomonic Orchestra presents Mozart’s fairytale masterpiece The Magic Flute, celebrates the triumph of love and reason over chaos and evil. With a hapless birdcatcher Papageno at his side, Prince Tamino seeks to rescue Pamina but in an unexpected twist of plot comes to realize that not everything is as it seems. Its premiere only 10 weeks before the composer’s untimely death, The Magic Flute is a tantalizing glimpse of a possible new creative direction for the composer had he lived. Presented in collaboration with MOstly Opera, this classic tale has long been a crowd-pleaser! Preliminary runtime of 2 hours and 15 minutes, with 1 intermission. Sung in English. Held at Richardson Auditorium at Lincoln University, Admission $15-5. ​1 [Thu] MMAMTA Musicathon time request deadline. Email request times to Tim Werts. 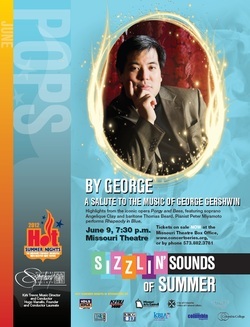 13 [Tue] 7pm: The Jefferson City Symphony Orchestra: "POPS Concert." Special Guests: Gary Sanders, pianist; Dancers’ Alley (Katy Howland, director); Helias High School Choir. Highlights of this season’s POPs Concert will include music by the Beatles and Freddy Mercury. Pianist Gary Sanders will again be featured as soloist with the JCSO in piano concertos from the movies including works by Miklós Rózsa, Leith Stevens, Charles Williams and James Horner. Tickets at the door: $15 General, $5 students. The Mitchell Auditorium, Lincoln University Campus in Jefferson City. 16 [Fri] 6:45pm: Odyssey Chamber Music Series Pre-concert presents Kristine Poulsen, flutist. 16 [Fri] 7pm: Odyssey Chamber Music Series: Baroque & Concerto. Bach Violin Concerto in E Major with 2018 Winner of the MMAMTA/Odyssey Pre-Collegiate Concerto Competition, Mozart Symphony No. 29 in A Major, and Bach Mass in F featuring Bach Collegium Choir and Odyssey Chamber Ensemble. $20 General Admission, $10 Student, Free Children Under 12. First Baptist Church, 1112 E. Broadway in Columbia. 23 [Fri] 7pm: Southside Philharmonic Orchestra with Patrick Clark. Haydn String Quartet Op. 76 No. 1 by the Southside String Quartet, the MMAMTA/Odyssey Pre-Collegiate Concerto Competition winner Hazel Keithahn in Bach Concerto in E Major, Mozart Symphony No. 29 in A Major. $10 General Admission, $5 Student. Central United Church of Christ, 118 W Ashley Street in Jefferson City. 25 [Sun]: 7:30pm: Columbia Civic Orchestra: River ongs of Missouri with Cathy Barton and Dave Para. Program includes Stefan Freund: Ragfare; Cathy Barton and Dave Para: Traditional Missouri Folk Tunes; Ferde Grofe: Mississippi Suite; John Cheetham: Missouri River Songs and Dances. This is A celebration of the musical heritage Missouri and its rivers featuring local folk musicians Cathy Barton and Dave Para. Free Admission. Missouri Theatre, 203 S. Ninth Street in Columbia. 5 [Fri] Deadline: MMAMTA /Odyssey Pre-collegiate Concerto Competition application. Requirement: Name of your accompanist, your head shot and a paragraph biography, and any one movement from a work composed for a soloist and a chamber orchestra year 1800 or earlier. You also must provide a clean copy of the score to the competition, to be submitted at the time of the audition. Audition is open to the public; donation is strongly recommended. Winner of the event must be able to perform at the evening concerts on February 16 at Odyssey Chamber Music Series in Columbia, and February 23 with Southside Philharmonic Orchestra in Jefferson City. More details will be available after July 1, 2017. 13, snow date 20 [Sat] 3pm: Odyssey Chamber Music Series: Kids@Heart, Tales Around the World. Free Admission. First Baptist Church, 1112 E. Broadway in Columbia. 14, snow date 21* [Sun] 2pm+: MMAMTA/Odyssey Pre-collegiate Concerto Competition. Donations accepted. First Baptist Church, 1112 E. Broadway in Columbia. *If snow date, the competition will take place beginning at 5pm. 21 [Sun] 3pm MMAMTA Teachers Recital. Whitmore Recital Hall at the MU School of Music. Donations are accepted. 7 [Thu] 5pm: Peter Miyamoto performs Chopin Etudes (Op 25-1 & 2, Op. 10-8) and Grande Valse Brillante Op. 18-1 and Ravel Jeux d'eau; pianist Ayako Tsuruta performs Ravel Piano Trio with violinist Julie Rosenfeld and cellist Eli Lara. Free Admission; limited seating. Odyssey Music @The Village of Bedford Walk, corner of Bethel and Nifong in SW Columbia. 3 [Fri] 7:30pm Southside Philharmonic Orchestra (SPO) at Central United Church of Christ in Jefferson City: Reformation Anniversary Concert, Admission $10-18. 4 [Sat] 7pm: Sean Chen in Piano Recital. Presented by the Missouri Music Teachers Association. 2013 Van Cliburn International Piano Competition laureate performs in the Hart Recital Hall of the University of Central Missouri in Warrensburg; Admission Free. 6 [Fri] 7:30pm: Faculty Recital: Peter Miyamoto, piano. 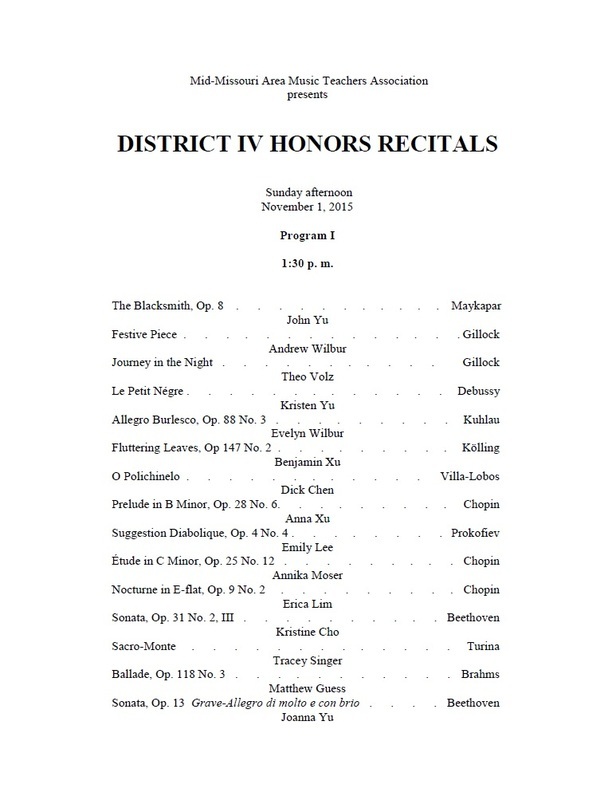 Solo recital program TBA. Whitmore Hall, the MU School of Music in Columbia. Admission $5. 13 [Fri] 6:45pm Pre-concert / 7pm: Odyssey Chamber Music Series: Season Premiere: "Akropolis" featuring Akropolis Reed Quintet, 2011 Plowman Grand Prize Winner. Admission $20 / Student $10. First Baptist Church, 1112 E. Broadway in Columbia. 22 [Sun] 1:30pm & 3pm: MMAMTA Honors Recital (Chairperson Shoko Nelson) at Columbia College. Free. Must commit to stay for the entire one recital. 22 [Sun] 3pm: A Joint Piano Recital by the students of Dr. Peter Miyamoto and Ayako Tsuruta. Free Admission; donations are accepted. Whitmore Recital Hall, the MU School of Music. Reception will follow. 28 [Sat] 11am-4:15pm MMAMTA Honors Recital (Chairpersons Peter Miyamoto/Ayako Tsuruta) at First Baptist Church of Columbia. *NOTE* There is a $10 participation fee per performer per appearance. 26 [Sat] 9am-2pm: MMAMTA Fall Workshop by Dr. Julie Knerr. MU School of Music. 1 [Sat] 2017-2018 MTNA Annual Fee Due. To be eligible in our MMAMTA directory for 2017-2018 please pay your MTNA dues before July 15, 2017. Details are available at mtna.org. 1 [Sat] Last application deadline, Odyssey Chamber Music Festival at MU. Piano & Percussion Program for pianists age 12-25. No auditions required; for information, visit www.OdysseyFestival.org . 3-14 [Mon-Fri] Odyssey Chamber Music Festival at MU. Summer Camp for pianists and percussionists age 12-25. No auditions required; deadline through July 1. For information, visit www.OdysseyFestival.org. ​1 [Thu] Application due, Odyssey Chamber Music Festival at MU. Piano & Percussion Program for pianists age 12-25. No auditions required; deadline June 1; late fees apply thereafter. For information, visit www.OdysseyFestival.org . 5 [Fri] 7pm: Odyssey Chamber Music Series: Season Finale: "Knoxville & Mexico." Admission $25 / $10 Students with I.D. First Baptist Church, 1112 E. Broadway in Columbia. 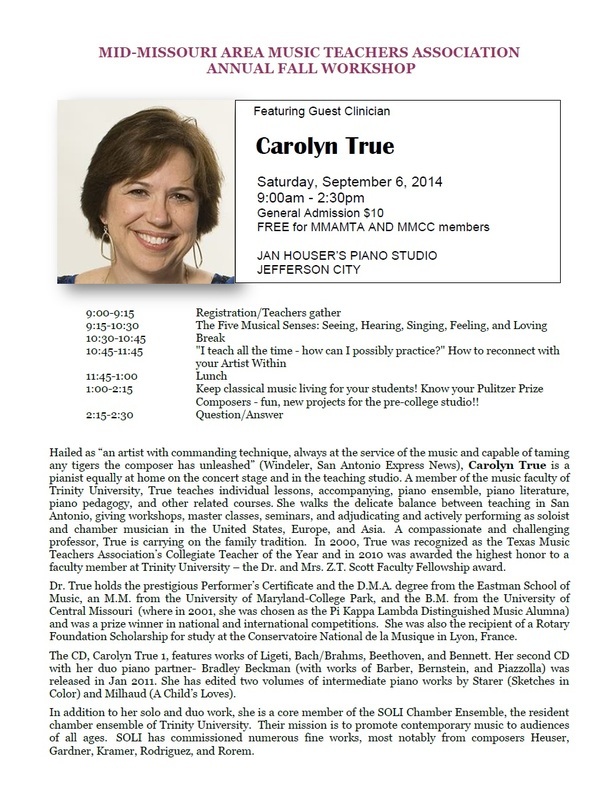 6 [Sat] 7:30pm: Columbia Civic Orchestra: "Triple Treat" - with CCC and Community Band. Rock Bridge High School in Columbia. 15-20 [Mon-Sat], 22-23 [Tue-Wed] National Guild Piano Teachers Auditions. The MU School of Music in Columbia. Anne Manahan, Chair. 25 [Thu] 11am: MMAMTA Annual Spring Luncheon, at Babbo's, 1305 Grindstone Parkway, #115 in Columbia, 65201. Menu CLICK HERE. 6 [Thu] 7pm: Plowman Chamber Music Festival: Recital by cellist Joel Krosnick and pianist Peter Miyamoto. $25 General Admission, $10 Student with I.D. First Baptist Church, 1112 E. Broadway in Columbia. 7 [Fri] 7pm: Plowman Chamber Music Festival: Solo Piano Recital by Alessio Bax, First Prize winner of Leeds and Hamamatsu International Piano Competitions, 2009 Avery Fisher Career Grant recipient. Free Admission; Donation is HIGHLY recommended. Whitmore Recital Hall at the MU School of Music in Columbia. 8 [Sat] 8am+: MMAMTA Scholarship Auditions for Summer Camps and College. Central United Church of Christ. Handbook pg 38-41. Chair: Karen Larvick. 8 [Sat] 9:30-5pm: Plowman Chamber Music Competition: Semi-Finals. Look for Plowman Passport subscription online or brochure (best deal); Admission $10 / $5 Students for a full day of premiere chamber music performances! First Baptist Church, 1112 E. Broadway in Columbia. 9 [Sun] 1:30pm: Plowman Chamber Music Competition: Finals. Look for Plowman Passport subscription online or brochure (best deal); Admission $25 / $15 Students. Missouri Theatre in Columbia. 15 [Sat] Odyssey Chamber Music Festival APPLICATION DEADLINE. DVD/CD Audition required. 26 [Wed] MMAMTA Concerto Festival Application deadline. Handbook pg. 43-44. Chair: Shoko Nelson. 1 [Wed] Odyssey Chamber Music Festival EARLY APPLICATION DEADLINE. DVD/CD Audition required. 3 [Fri] Plowman Master Class for pre-collegiate students APPLICATION DEADLINE. Live audition 3/12 [Sun] or 3/18 [Sat] for horn, cello and piano students whose instructor has been a MMAMTA member since Fall 2016. 17 [Fri] 7pm: Odyssey Chamber Music Series: "M-Odyssey." Admission $10 / $5 Students. First Baptist Church, 1112 E. Broadway in Columbia. 19 [Sun] 7:30pm: Columbia Civic Orchestra: "MOCOP." Broadway Christian Church in Columbia. 3 [Fri] Missouri Federation of Music Clubs (MFMC) Festival Registration & Fee Junior District 3 (JC) deadline. 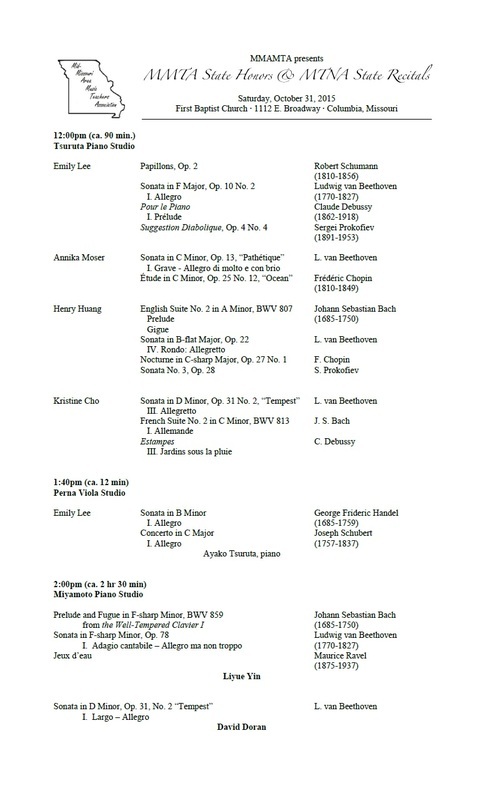 3 [Fri] MU Faculty Recital Series: Piano Recital by Dr. Peter Miyamoto. Music by Berg, Ravel, Beethoven, Rachmaninoff and Liszt. Admission $5 / Free with MU I.D. Whitmore Recital Hall at the MU School of Music in Columbia. 17 [Fri] MFMC Festival - All Completed Critique Sheets Junior District 3 (JC) deadline. 18 [Sat] 3pm: Odyssey Chamber Music Series: "Baroque & 1916." Admission $25 / $10 Students. First Baptist Church, 1112 E. Broadway in Columbia. ​26 [Sun] 7:30pm: Columbia Civic Orchestra: "American Concert." 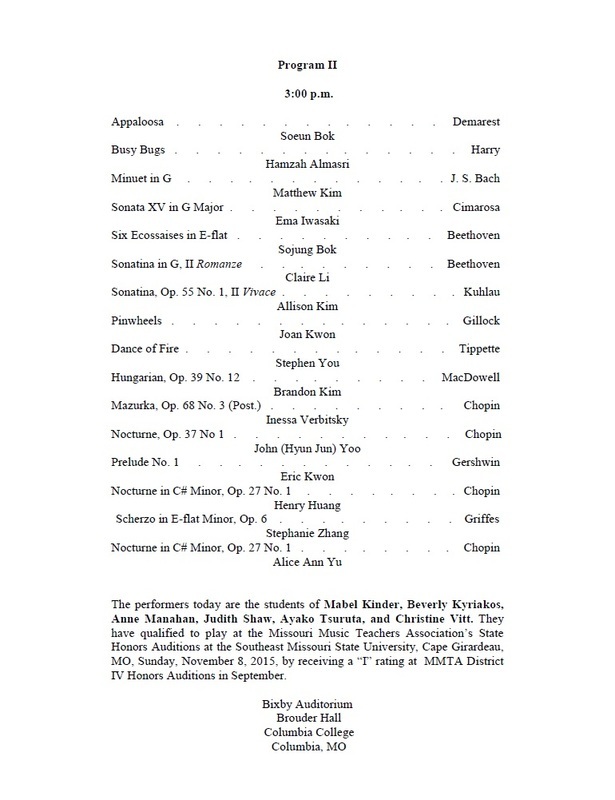 Program: Copland: Four Dance Episodes from Rodeo; Henry Stewart: Piano Concerto with Natalia Bolshakova, guest pianist; Don Freund : Preludes for Orchestra; Bernstein: Symphonic Dances from West Side Story. Missouri Theatre, 203 S Ninth Street in Columbia. 6-8 [Fri-Sun] MTNA West Central Competition. University of Colorado Boulder. 16 [Mon] MFMC Registration & Fee Junior District 2 (Columbia) DEADLINE. 16 [Mon] 7pm: Boone Historical Society Concert Series presents Peter Miyamoto and Ayako Tsuruta in a two-piano recital. Program TBA. Admission $20, $10 Students. Boone Museum & Galleries, 3801 Ponderosa in the South of Columbia off Nifong. (573) 443-8936 or www.boonehistory.org. 22 [Sun] 3pm: MMAMTA Teacher's Recital. First Christian Church in Jefferson City. To sign-up, please contact Carline Waugh. MMAMTA semi-annual meeting after the concert, ca. 4pm. 29 [Sun] 3pm: Voice Faculty Concert by Jaice Wenger, piano, featuring Julia Bentley, Christine Seitz, Steven Jepson and Steven Tharp, assisted by Alice Dade, flute and Rachel Menscher, piano. Admission $5. Whitmore Recital Hall at the MU School of Music. ​2 [Fri] 7pm: Odyssey Chamber Music Series: "Hot Winter Sleigh!" Exciting two piano arrangement of Leroy Anderson's classic, "Sleigh Ride" by Greg Anderson; Nikolai Kapustin's Concerto for two pianos and percussion; more chamber music sparks with DRAX Duo with percussionist Megan Arns and saxophonist Leo Saguiguit with guest percussionist Robert Dillon. Look for Odyssey Passport subscription online or brochure (best deal); Admission $25 / $10 Students. First Baptist Church, 1112 E. Broadway in Columbia. 10 [Sat] 7pm: Community Christmas Concert: Columbia Civic Orchestra. Christmas Concert with Community and MUMC Choirs. Program: Vaughan Williams: Fantasia on Greensleeves ; The Many Moods of Christmas Suites No. 1 and 3 with Columbia Community Chorale ; Handel: The Messiah with MUMC Choir. Missouri United Methodist Church in Columbia. 18 [Sun] 3pm: Missouri Symphony Society presents Missouri Symphony Orchestra's Symphony of Toys. Missouri Theatre. Admission $18 /$10. 1 [Wed] LAST Application deadline (with late fee) for Odyssey Chamber Music Festival. For additional C.O.M.P. Camp information, please click here. 20-24 [Mon-Fri] Music of the World Piano Camp and Piano Camp. A fun summer camp for young pianists ages 6-10. Students will experience music, dance, and crafts from all around the world! No prior piano experience is required. Early bird discount ($10 off) for applications received by May 2, 2016. Deadline to apply: June 6 To apply click here. Please direct questions to Dr. Paola Savvidou, savvidoup@missouri.edu. 6 [Fri] 7pm: Odyssey Chamber Music Series, Season Finale: Dichterliebe - A Poet's Love. A musical journey around the world ends in Germany and Austria. 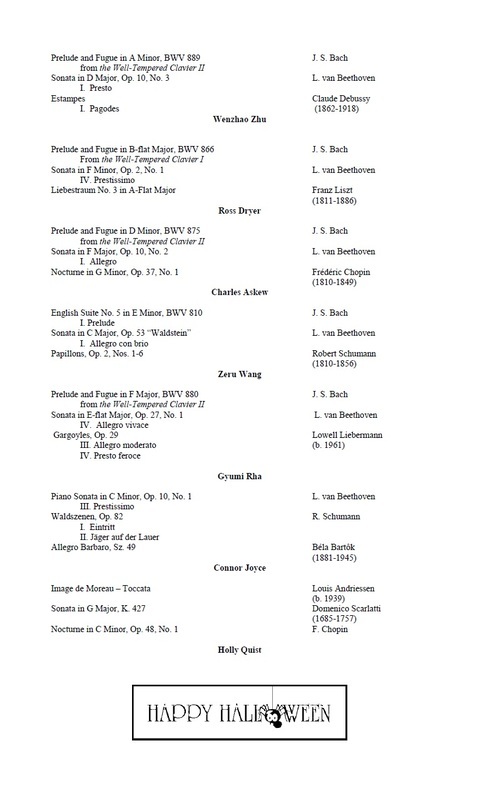 Featured in this program are Schumann's sublime "Dichterliebe" performed by Steven Tharp, tenor and Peter Miyamoto, piano, and Schubert's epic Octet performer by Bill Kalinkos, clarinet; Kara LaMoure, bassoon; Marcia Spence, horn; Esterhazy String Quartet (Eva Szekely, Julia Rosenfeld, Leslie Perna, Darry Dolezal) and Sue Stubbs, double bass. Reception post-concert will follow. Admission $20 / $10 Student with I.D. First Baptist Church in Columbia. 15 [Sun] *Extended* application deadline for Odyssey Chamber Music Festival. Late fee will apply after this date. 9 [Sat] 7:30pm: MU Faculty Lecture/Recital: Command Performance: Music at Victoria's Court by Michael Budds. Admission $5, MU faculty and students free with I.D. Whitmore Recital Hall, MU School of Music in Columbia. 12 [Tue] 7:30pm: MU Faculty Series: Julie Rosenfeld, violin and Peter Miyamoto, piano. Admission $5, MU faculty and students free with I.D. Whitmore Recital Hall, MU School of Music. 16 [Sat] 7:30pm: Columbia Chorale presents From Darkness to Light: Music of Bach and Mendelssohn. Columbia Chorale explores themes of deep suffering, pain, and mourning that give way to joy and comfort in its thrilling performance of J.S. Bach’s cantata Ich hatte viel Bekümmernis (“I had much trouble in my heart”), BWV 21, and Felix Mendelssohn’s Psalm 42, Op. 42, Wie der Hirsch schreit (“As pants the Hart”). Tickets: $10 in advance/$15 at the door/$5 student with ID. First Presbyterian Church, 16 Hitt St in Columbia. 22 [Fri] 7:30pm: MU Faculty Series: Faculty New Music Ensemble. Admission $5, MU faculty and students free with I.D. Whitmore Recital Hall, MU School of Music in Columbia. 6 [Sun] 3:00pm, Salvation Army Women's Auxiliary League presents "Music in the Air," a benefit concert. Admission $20 / $10 Student. Broadway Christian Church, 2601 Broadway in Columbia. See Columbia Tribune article, HERE. 6 [Sun] 7:30pm, MU Faculty Series: Esterhazy Quartet. Admission $5, MU faculty and students free with I.D. Whitmore Recital Hall, MU School of Music in Columbia. 14 [Mon] 7pm "Classy Music by Classy Ladies," Presentation by Dr. Ruth Robertson, in celebration of Women's History Month. Hear stories about the women composers (and their men!) and listen to recordings. Composers included are Hildegard von Bingen, Fanny Mendelssohn, Clara Schumann, Pauline Viardot, Amy Beach, Dame Ethel Smyth, Alma Mahler, Ruth Crawford Seeger, and more. Unitarian Universalist Fellowship, 1021 Northeaast Dr, in Jefferson City. Free Admission. ​18 [Fri] 7pm Odyssey Performance Fellows present "M-Odyssey: CROSSROADS". “M-Odyssey” will continue the 2015 initiative to mentor and give real work experience in music administration to young professionals. One or two outstanding musicians will have the opportunity to create and produce their own Odyssey concert, with guidance from the Artistic Director and a supervising Board Member. The title reflects the more modern, “MOD” Odyssey for younger directors, while the capitalization pays homage to our state. 2016 program is presented by violinist Xiaoxiao Du and saxophonist Joseph Rulli, featuring musicians from MU including Ryan Marquardton guitar, Graham Woodland on violin, Clifton Gillilland on viola, Shannon Merciel on cello, and pianists Ben Colagiovanni and Zeru Wang on piano. Admission: $10 General, $5 Student with I.D. First Baptist Church, 1112 E Broadway, in Columbia. 20 [Sun] 7:30pm: Columbia Civic Orchestra presents Missouri Composers Orchestra Project. Featuring works by MOCOP winners. Broadway Christian Church. Admission TBA. 21 [Mon] 7:30pm: MU Faculty Series: Eva Szekely, violin and Daniel Schene, piano. Admission $5, MU faculty and students free with I.D. Whitmore Recital Hall, MU School of Music. ​Mar 26 - Apr 3: Happy Spring Break! Mar 31 [Thu] 7pm: Recital by Carline Waugh, soprano, with Dr. Keastner Robertson, piano. A fun program of Fauré, Duparc, Obradors, Gwyneth Walker and others - some spirituals, old and new. Lincoln University in Jefferson City. 1 [Mon] 7:30pm: MU Guest Artist Series: Daniel Schene Piano Recital. Free Admission. Whitmore Recital Hall, MU School of Music in Columbia. 8 [Mon] 7:30pm MU Faculty Series: Peter Miyamoto Piano Recital. Program includes Beethoven Sonata Op. 110, Brahms Sonata No. 3. Admission $5, MU faculty and students free with I.D. Whitmore Recital Hall, MU School of Music in Columbia. 11-13 [Thur-Sat], 7:30pm and 14 (Sun), 4pm Central Methodist University (CMU) Opera Workshop presents "A Valentine Toast to Opera & Musicals," Kountz Recital Hall, Swinney Conservatory of Music, Central Methodist University, Fayette. General Admission $7/ CMU Faculty, Staff & Seniors $5/All students $2. 13 [Sat] 7:30pm Misouri Theatre: Alarm Will Sound. Ligeti's Chamber Concerto, Piano Concerto featuring Paola Savvidou, among other pieces. Admission - go to Eventpros.com. 15 [Mon] 7:30pm MU Faculty Series: Missouri Quintet. Admission $5, MU faculty and students free with I.D. Whitmore Recital Hall, MU School of Music in Columbia. 20 [Sat] TBA: MMAMTA Musicathon Events in Columbia, Tim Werts, Chair.Lucky's Market and Yamaha Piano Distributors. 21 [Sun] TBA: MMAMTA Musicathon Events in Columbia, Tim Werts, Chair. Lucky's Market and Yamaha Piano Distributors. free with I.D. Whitmore Recital Hall, MU School of Music in Columbia. 11 [Mon] Missouri Federated Music Clubs Jr Festival Application Due! ​16 [Sat] 2pm Odyssey Chamber Music Series: Kids@Heart - Instrumental Zoo! Free Admission. First Baptist Church in Columbia. 16 [Sat] 3pm Odyssey Chamber Music Series: Kids@Heart - Carnival of the Animals, Missouriana edition, with KBIA's Trevor Harris, Narrator. Co-sponsored by MMAMTA, this concert features musicians of all ages and many variety of instruments inspired by the animals and people around us! Admission is FREE for this concert. Come for loads of fun, balloons and FREE raffles! First Baptist Church in Columbia. 25 [Mon] 7:30pm: MU Faculty Series: Kara LaMoure, bassoon. Admission $5, MU faculty and students free with I.D. Whitmore Recital Hall, MU School of Music in Columbia. 4 [Fri] 7pm: Odyssey Chamber Music Series present "Russia & Slovakia." Program features harpist Maria Duhova Trevor and flutist Kristine Poulsen, Iskander Akhmadullin on trumpet, pianist Natalia Bolshakova, and Rachmaninoff Symphonic Dances for two pianos with Peter Miyamoto and Ayako Tsuruta. Admission $20 / $10 with student I.D. ; First Baptist Church in Columbia. 10 [Thu] 7pm The Columbia Handbell Ensemble Winter Concerts will be presented on Dec 10 and 13 in the First Baptist Church sanctuary at 7 and 3pm respectively. This nationally recognized group will be play seasonal works of Tchaikovsky, familiar carols, and the uproarious “The Twelve Days After Christmas.” Tickets may be reserved with Madison in the church office, or by contacting Noah Hartsfield or Ed Rollins. 12 [Sat] 4pm Columbia Civic Orchestra presents Tchaikovsky's Nutcracker Suite with Perlman-Stoy School of Ballet. present scenes from Tchaikovsky’s Nutcracker Suite, Leroy Anderson’s “Sleigh Ride” and Rimsky-Korsakov’s fabulous “Suite for Christmas Eve.” The concert begins at 4 pm. Tickets are $15 for adults, $5 for students, and may be reserved at http://cco.missouri.org/ or purchased at the door. 13 [Sun] 3pm 10 [Thu] The Columbia Handbell Ensemble Winter Concerts will be presented on Dec 10 and 13 in the First Baptist Church sanctuary at 7 and 3pm respectively. This nationally recognized group will be play seasonal works of Tchaikovsky, familiar carols, and the uproarious “The Twelve Days After Christmas.” Tickets may be reserved with Madison in the church office, or by contacting Noah Hartsfield or Ed Rollins. 20 [Sun] 3pm Missouri Symphony Society presents Symphony of Toys. Members of Columbia Chorale and Columbia Youth Choirs (CYC) team up with the Missouri Symphony Society's Children's Chorus to perform selections during the Missouri Symphony Orchestra's annual holiday concert. 6 [Fri] 7:30pm: Columbia Chorale presents "Luminous Night." Columbia Chorale begins its 37th season with Columbia Chamber Choir, now in its second year, as they present the radiant works of Norweigian composer Ola Gjeilo and French composer Gabriel Faure. Gjeilo's Sunrise Mass and Luminous Night of the Soul and Faure's Requiem. $10 in advance/$15 at the door/$5 student with ID. First Baptist Church in Columbia. 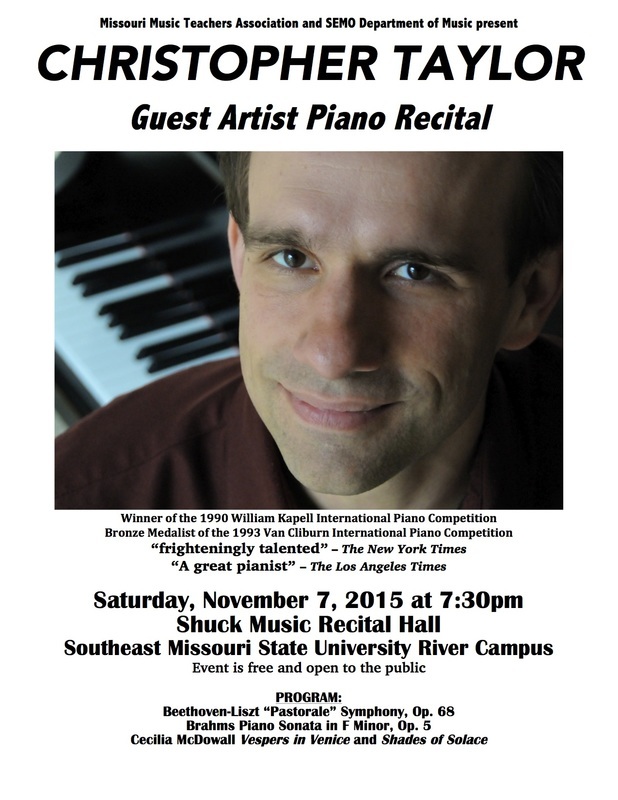 15 [Sun] 3pm: Fall Piano Showcase Concert at the Missouri Theatre. Admission $8. 19 [Thu] 7pm: MU Choral Union: Gloria! The Sounds of the Season. Jesse Auditorium. 20 [Fri] 7pm: Missouri Symphony Society presents Juilliard String Quartet, sponsored by Paul D. Higday Mozart Trust. The Juilliard String Quartet visits Columbia during their 70th season and farewell tour for cellist Joel Krosnick. Playing works by Schubert, Elliott Carter, and Debussy, this performance event is the highlight of the fall concert season. Don’t miss the magic of America’s quintessential string quartet! Missouri Theatre in Columbia. 30 [Mon] 7pm: MU Faculty Series: Holiday Brass. Missouri United Methodist Church, 204 S Ninth Street in Columbia. Admission. 1 [Thu] 7:30pm: MU Faculty Series: Bill Kalinkos, clarinet and Peter Miyamoto, piano. Admission $5, free with MU I.D. Whitmore Recital Hall, MU School of Music. 2 [Fri] 7pm: Columbia College Faculty Concert: Darrell J. Jordan, baritone with Ayako Tsuruta, piano, Paul Seitz on lute, guest; Christine Jarquio Nichols, soprano. Bixby Hall, Columbia College. 3 [Sat] 8:30am-5pm: Auditions, Piano Showcase presented by MOSS Women's Symphony League at the Missouri Theatre. 4 [Sun] 3pm: MU Faculty Series: Julie Rosenfeld, violin and Janice Wenger, fortepiano. Admission $5, free with MU I.D. Whitmore Recital Hall, MU School of Music. 16 [Fri] 7pm: Odyssey Chamber Music Series, Season 12 Season Premiere. "A Taste of Asia," co-sponsored by the MU Asian Affairs Centre. Program includes Japanese Songs arranged for baritone and piano, Chinese work for saxophone and percussion, and a number of works newly written for erhu and piano. Featured guest artists include pianist Corey Hamm from University of British Columbia in Canada and erhu player Nicole Ge Li. Admission $20 / $10 with Student I.D. includes reception after the concert. First Baptist Church in Columbia. 18 [Sun] 3pm: MU Faculty Series: Steven Tharp, tenor and Janice Wenger, fortepiano. Admission $5, free with MU I.D. Whitmore Hall, MU School of Music. 2 [Wed] 12pm: "Piano Fantasies" presented by Karen Larvick. 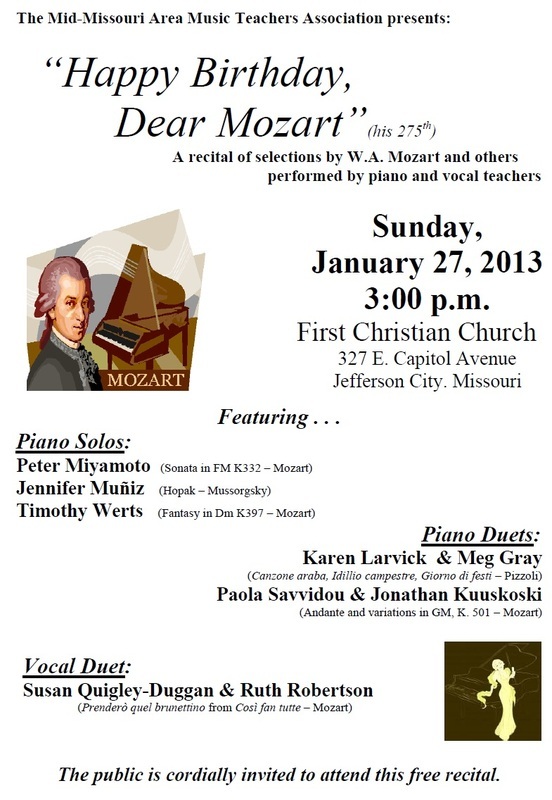 Solo repertoire by Mozart, Chopin, Brahms, and Dello Joio. Duets with Jan Houser (Schubert Fantasy in F minor) and Denise Gillam (Fantasy Duet, arranged by Howard Helvey, JC and MU graduate). First Presbyterian Church in Jefferson City. Free admission. 12 [Sat] 9am-2pm: MMAMTA Fall Workshop, Guest Clinician Wendy Stevens. $10 General Admission, Free for members of MMAMTA and MMCC. Please register with Dr. Paola Savvidou via e-mail. Location: Kyriakos Piano Studio in Columbia / 9-10:20am: The Best Stress-Free Practices for Your Studio / 10:20-11:40am: Rhythm Practice SHOULD be fun! Here's how to make it so... / 12:50-2pm: Have You Forgotten What It's Like To Be A Child? 13 Sun] 3pm: MU Faculty Series: Leslie Perna, viola and Janice Wenger, piano. Admission $5, free with MU I.D. Whitmore Recital Hall, MU School of Music. 14 [Mon] 7pm: The "Blind" Boone Piano Concert Series with harpist Maria Duhova Trevor and pianist Ayako Tsuruta. All Blind Boone Piano Concerts are open to the public. Tickets are $20 for adults and $10 for children under 12. All proceeds support the Historical Society and the Piano’s Endowment Trust Fund. Walters-Boone County Historical Museum and Galleries, 3801 Ponderosa St in Columbia. 14 [Mon] 7:30pm: MU Faculty Recital Series: Alice K. Dade, flute and Peter Miyamoto, piano. Admission $5, free with MU I.D. Whitmore Recital Hall, MU School of Music. 18 [Fri] 7:30pm: MU Guest Artist Series: Michael Heald, violin and Peter Miyamoto. Admission $5, free with MU I.D. Whitmore Recital Hall, MU School of Music. 20 [Sun] 7:30pm: MU Faculty Series: Timothy Howe, trombone and Paola Savvidou, piano. Admission $5, free with MU I.D. Whitmore Recital Hall, MU School of Music. 27 [Sun] 3pm: MU Guest Artist Series: Julie Bees, piano in recital. Program includes Chopin Preludes, Op. 28. Admission Free! Whitmore Recital Hall, MU School of Music. July 30 - August 2 [Thu-Sun] Mid-America Music Festival at the Marriott Airport St. Louis Hotel in St. Louis, Missouri. 9 [Sun] Duo Recital by Allison Roebuck, oboe and Peter Miyamoto, piano. Admission Free; Donations are accepted. First Christian Church in Jefferson City. Friday, July 24th, 7:30pm, Missouri Theater - Mizzou New Music (Featuring the New Music Ensemble, New Muse Piano Duo, and DRAX). 5 [Tue] 7pm: Jefferson City Symphony Orchestra. "Our next performance is Tuesday, May 5 at 7:00 PM in the Mitchell auditorium in Lincoln Unversity's Richardson Fine Arts Center. This is our piano concerto concert featuring Michelle Nam, our 2015 competition winner. Ms Nam is pursuing a DMA in Piano Performance at the UMKC Conservatory." Prokofiev Concerto No. 3. Tickets are $15/$5 Student; available for purchase online HERE. 8 [Fri] 7pm: Odyssey Chamber Music Series presents "American Soundscape," featuring works by American composers, including John Corigliano's "Chiaroscuro" for two pianos. Admission at the Door or Online, $20/$10 Student with I.D., Free for Children Under 12. First Baptist Church in Columbia. 13-16 [Wed-Sat] National Guild of Piano Teachers Auditions, at Houser, Gillam and Larvick studios. Jefferson City Chairman: Jan Houser. 6 [Mon] 7:30pm: Eva Szekely, violin and Daniel Schene, piano. Admission $5. Whitmore Recital Hall at the MU School of Music in Columbia. 7 [Tue] 7:30pm: Guest Artist Recital - Bartok Sonata for two pianos and percussion by the St. Louis Symphony Orchestra musicians. Admission $5. Whitmore Recital Hall at the MU School of Music. 12 [Sun] 3pm: Faculty Concert: Mozart duos by Julie Rosenfeld, violin and Janice Wenger, fortepiano. Whitmore Recital Hall at the MU School of Music in Columbia. 13 [Mon] 7:30pm: MU Chancellor’s Concert. Concert featuring MU’s large and small ensembles. Admission $5. Missouri Theatre, Columbia. 2 [Mon] 7:30pm: Zodiac Trio. Whitmore Recital Hall at the MU School of Music in Columbia. 6 [Fri] 7pm: Odyssey Chamber Music Series: Odyssey Performance Fellows present "Classic POP". $10 General Admission / $5 Students with I.D. / Free Children Under 12. First Baptist Church in Columbia. 7 [Sat] 2pm: Guest Artist Recital, Varshavski & Shapiro Piano Duo. 3:30pm: Pedagogical presentation on teaching piano duos. 7 [Sat] 7pm: Columbia Civic Orchestra/ Missouri Composers Orchestra Project. Broadway Christian Church in Columbia. 8 [Sun] 2pm: Piano Ensemble Concert with MU students, MMAMTA Teachers, CMP and Experiencing Piano students. Whitmore Recital Hall at the MU School of Music in Columbia. 8 [Sun] 7:30pm: New Music Ensemble. Whitmore Recital Hall at the MU School of Music in Columbia. 19 [Thu] 7pm: Sergei Babayan in Piano Recital, First Baptist Church in Columbia, presented by the 7th Plowman Chamber Music Competition & Festival. 20 [Fri] Master Classes by the 2015 Plowman Judges, made possible by the MU School of Music and MU Lecture Grants, in addition to supporting organizations co-presenting the 2015 Plowman Competition & Festival. 22 [Sun] 1:30pm: Plowman Chamber Music Competition: Finals Concert & Awards Ceremony at the Missouri Theatre. Admission $25/10. 2014 Piano Showcase Performers at the Dress Rehearsal. GREAT NEWS!! - Successful "Keys for Kids"
Fantastic News! The Keys for Kids Project was successful! We hit the mark this week- all keys were purchased, so the Kawaii piano is completely paid for. It is being delivered to Girls and Boys Town of Missouri this week. - a formal 'kick-off' for the piano's upcoming career. All who donated are invited to attend. lots of community members working together to fund a community musical project. - MMAMTA- who "jump-started" the fundraising thru their studio performances at Macy's during the Musicathon in February. A full listing of donors will be published and a plaque made to acknowledge them. If you know others who contributed, please help spread the word and the invitation. "Lions and Tiger and Bears, Oh My! 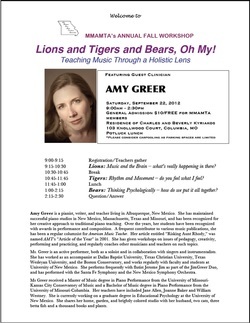 - Teaching Music Through a Holistic Lens"
9:15-10:30 Lions: Music and the Brain - what's really happening in there? 10:45-11:45 Tigers: Rhythm & Movement - do you feel what I feel? 1:00-2:15 Bears: Thinking Psychologically - how do we put it all together? • Application deadline is 3:00 p.m. eastern time on September 12, 2012. • Current active membership dues for MTNA or a nonmember teacher fee must be paid prior to accessing the student competition application. • Compositions will be uploaded online as a PDF file. Scores are NOT to be mailed. For complete competition information, visit www.mtna.org. June 16 at 7:30pm with the Missouri Symphony Orchestra! Read all about MSO in Columbia Tribune, HERE. For MSO schedule, click HERE. at the end of the month with MMAMTA member Leo Saguiguit as the soloist for Lee Actor's "Concerto for Saxophone." Other pieces in the program include familiar tunes, such as "The Star Spangled Banner," "God Bless America,"
and "Stars and Stripes Forever." Pianist Peter Miyamoto was the soloist for the Gershwin's famous Rhapsody in Blue. Beverly Kyriakos in Sunday Columbia Tribune, June 10 - HERE. Join Beverly Kyriakos at the organ in Saint-Saens's mighty Organ Symphony! This excellent program also features La Muse et le Poete" for violin, cello and orchestra, as well as Smetana's "The Moldau," a stirring tribute to the Czech people and their great river. Spring 2012 - Keys for Kids Fundraiser! The Music Suite are sponsoring a fundraiser to purchase a Kawai Institutional Studio Piano for Boys & Girls Town. For each $60 donation, your name or organization’s name will be put on a key of your choice so that we can see our progress and encourage others to join us. Our goal is to present the piano to Boys & Girls Town during National Music Week in May. Join the list of those planning to participate by calling Cara McMillan at (573) 446-5544. DOWNLOAD ATTACHED POSTER FOR MORE INFORMATION! This is a wonderful opportunity for us to give back to the community. Let’s all work together to make it happen! Sunday January 29, 2012 at 3:00 p.m.